A split or torn earlobe is one of the most common aesthetic deformities of the ear. This can result from heavy earrings, an earlobe that is pierced in an improper position, or from trauma to the lobe. Regardless, it can cause distress to the patient who wants to continue to wear earrings or would like to restore symmetry to their earlobes. Fortunately, there is a simple and effective procedure that can fix these earlobe tears in the office. Only local anesthesia is required. It typically takes less than one hour to complete in the office. The degree of the earlobe tear helps to determine the type of repair needed. Small flaps are sometimes used to redesign the earlobe. Absorbable sutures are typically used, and due to their color and small size, they are well-camouflaged. Dr. Greene uses specialized suturing techniques to minimize scar formation. There is minimal discomfort after earlobe repair and if necessary, Tylenol is effective for any mild discomfort. Patients can return to work immediately following the procedure. In most cases, dissolvable sutures are placed, so no suture removal is necessary. Dr. Greene can re-pierce your ear for you if desired. 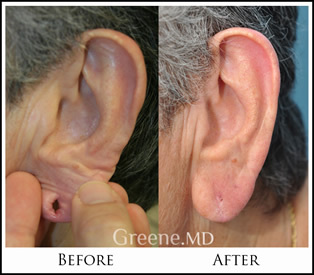 To schedule your complimentary consultation for an earlobe repair, call 954-651-6600 or email us at GreeneMD@DrRyanGreene.com. How is an earlobe repair formed? If the earlobe is completely split, a small amount of skin is removed. The ends of the split earlobe are then sutured together with very small sutures. Where is an earlobe repair performed? 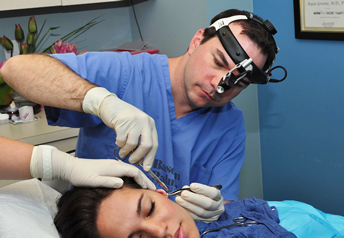 Earlobe repair is performed in Dr. Greene’s office. What type of anesthesia is used for an earlobe repair? Only local anesthesia is required for the procedure. No sedation is necessary. An earlobe repair takes less than our hour to complete. Because the split earlobe is stitched together, a scar will form. This scar is typically a fine line that is difficult to detect. How much pain is there after an earlobe repair? There is almost no discomfort after an earlobe repair. How much time off from work or school is required? No time is required out of work or school after an earlobe repair. When are the stitches removed after an earlobe repair? After an earlobe repair, the stitches are usually removed or dissolve on their own in about a week. When can the earlobe be re-pierced after an earlobe repair? Sometimes Dr. Greene will re-pierce the earlobe during the procedure. In some patients, the ear can be re-pierced after it has healed. Usually about one month is sufficient. All types of surgery have potential complications. Complications associated with an earlobe repair are excessive scar formation, infection, notching, and recurrence. This patient requested repair of her left earlobe. In her post-operative photo, note that the line along her earlobe is a skin fold and does not represent the scar, which is faintly visible behind the skin fold.